The 'iwan' screen of the Quwwat al-Islam mosque at Mehrauli viewed from the north east, with the Iron Pillar and other antiquities also visible. bl.uk > Online Gallery Home	> Online exhibitions	> Asia, Pacific and Africa Collections	> The 'iwan' screen of the Quwwat al-Islam mosque at Mehrauli viewed from the north east, with the Iron Pillar and other antiquities also visible. 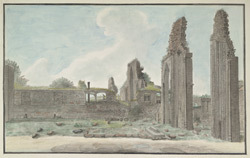 Water-colour painting of the iwan screen of the Quwwat al-Islam mosque at Mehrauli viewed from the north, by an unknown artist between 1808 and 1820. The Quwwat-ul-Islam Mosque, literally translated as the Might of Islam, was constructed following the establishment of Muslim rule from Delhi. It was begun by Qutb-ud-Din Aybak in 1193 and completed 4 years later on the site of Rai Pithora’s Hindu temple. Twenty-seven Hindu and Jain temples were levelled to provide enough masonry for the new structure and the Hindu influence permeates the whole complex. Motifs such as tasselled ropes, bells, tendrils, cows and leaves can all be traced on the masonry in richly carved detail. The mosque was enlarged a century later by Sultan Ala-u'd-din Khalji, although the extension was never completed.